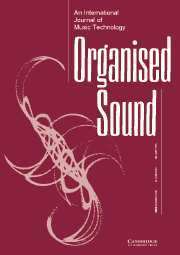 This is not really news, but an article by myself and Miya Yoshida on my interactive sound installation etherSound was published in Organised Sound in 10:2, 2005 pp 121-127. You can buy the article here. Click more to read the abstract. In this article we discuss the notion of ‘interaction’, ‘participation’ and ‘the public’ in artistic work, specifically within the context of the exhibition The Invisible Landscapes (curated by Miya Yoshida, Malmö Konstmuseum, 2003) and etherSound (created by Henrik Frisk), a sound installation displayed in that exhibition. In this work the audience is invited to participate in the creation of new sound events by sending text messages from their mobile phones. Thus, our discussion is focused on the space and the mode of participation opened up by new communication technology. Based on our experiences of that project, we introduce and explain what we believe are relations of creative production and a different kind of creativity that may emerge from active interaction. We also attempt to describe what we believe an implementation of active public participation can lead to. We are combining two modes of thinking in this article; one is inspired by a discourse of cultural theories and the other by reflection on our experience of the event. The latter is, by definition, rather subject centred and expansive based on individual observation. We examine and analyse the phenomenon of ‘participation’ whilst playing etherSound as a process of creative production, and seek to reflect upon the power of the co-operative practice and its relation to participation and creativity.